This post has been sponsored by Dollar Tree as part of the 2017 Holiday Gift Guide. All thoughts expressed in this post are 100% my own. The holiday season is upon us and with the list of items to buy for holiday parties, family gatherings, and gifts, we need to find ways to save money wherever possible. My favorite way to save money for the holidays is by shopping at Dollar Tree. I am a huge fan of shopping at Dollar Tree and shop there weekly for supplies that my family needs. That makes them my first stop when planning for the holidays. To help you save money for the holidays, I am sharing with you my top 10 items to buy at Dollar Tree. Party Supplies/Decorations – My favorite items to buy for party supplies are tablecloths, plastic silverware, napkins, invitations, balloons, and streamers. You can also find a wide variety of holiday themed decorations that make decorating for your party a breeze. Paper Goods – They have a wide variety of solid and patterned plates, napkins, and cups that are perfect for parties. These are a fraction of the price that you would pay in big box stores and allow you to customize your paper goods to your party colors. Balloons – They offer a wide variety of helium, foil balloons that are perfect to decorate your party space or to tie on top of gifts. Plus if you buy them online through DollarTree.com, your local store will inflate them for free. Craft Supplies – Find a variety of items to create your own holiday crafts including artificial flowers, holiday themed supplies, and more. Glassware – During the holidays, I often find that I don’t have enough glasses for holiday parties. Some are informal and paper or plastic cups are find but for the parties where you need real glasses Dollar Tree is the place to shop. You can find a wide variety of styles and sizes that will complete any party style. Dinnerware – I love mixing up my dinnerware for the holidays and with many seasonal styles you can create a dinnerware set for every holiday at only $1 each. Impress your friends and family with your never-ending dinnerware selections and your eye for savings. Cards – You can find a selection of cards for $1 each or 2/$1 . These are a great way to send special holiday cards for family members that are unique for them. I shop here for my cards for my parents, great aunt, niece, and nephew. Serving Utensils – Some potlucks require you bring serving utensils but I always worry that I won’t get mine back. By picking up my serving utensils at Dollar Tree, I no longer worry if I get them back. If I do, I wash them and save them for the next potluck. Aluminum Pans – Just like serving utensils, I don’t want to worry about bring my serving dishes home. You can find a variety of sizes and they can be easily recycled/tossed when the potluck is over. Disposable Containers – These are a great way to send leftovers home with your guests without them needing to return containers. You can also use these to gift baked goods during the holidays and refrigerate your own leftovers. These are my top 10 items that I shop for at Dollar Tree during the holiday seasons but there are so many more that you will discover while you are there. You can also shop online at Dollar Tree for a wide variety of items and have them delivered to your house or to your local store. Shipping to your local store is usually FREE and a great way to buy items when you need more than one. Items are available in small units or by the case. 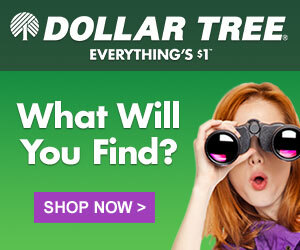 Check out the wide variety of items available online at Dollar Tree. Head on out to your local Dollar Tree to save money for the holidays or visit DollarTree.com to shop online.